Are you an MDaemon user and still wasting time dealing with spam email? 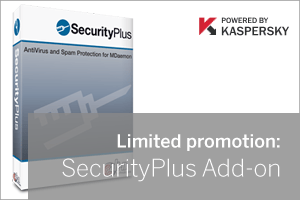 Now is a great time to take SecurityPlus for a test drive as Alt-N Technologies are offering 20% off all NEW licences until the end of June 2014 (discount applied automatically during checkout). We’re big fans here of the Outbreak Protection element of SecurityPlus because it offers real-time protection against new threats, without the need to get involved with adjusting rules or spending hours fine tuning settings. Of course, everyone has an opinion on which AV vendors work best but in our experience, and in the context of email protection, we still find Kaspersky to be one of the most robust and quickest to respond to fast moving virus campaigns such as Cryptolocker. SecurityPlus is very straightforward to install and even simpler to remove if you’re not suitably impressed, so don’t delay, download that free trial!